With its infrastructure complete, the streets, water and sewer systems of Branson Commerce Park were turned over to the City of Branson today. This 200-acre development on the north side of Branson is designed for commercial, light-industrial and residential development. 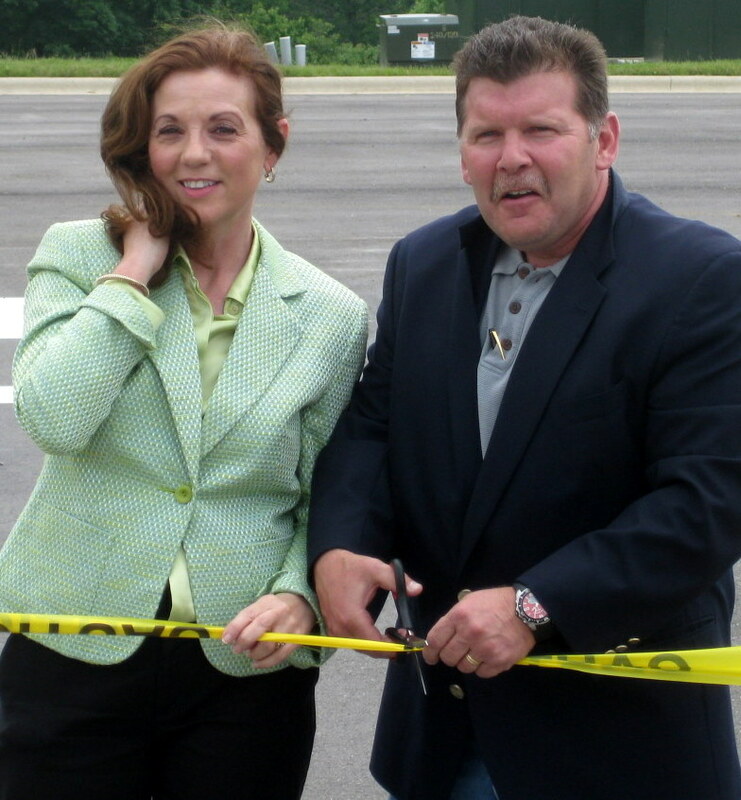 In the photo, owner’s representative Phil Lopez and Branson mayor Raeanne Presley prepare to cut the ceremonial ribbon. The original developer of Branson Commerce Park took advantage of Missouri’s Community Improvement District (CID) statutes to finance the installation of streets and water, sewer and underground telecommunication lines. Rather than install the infrastructure in phases, with years of construction traffic, the digging and disruption is over, except for what takes place on each lot. The CID program as used here does not involve the use of any taxpayer outlays or liability. However, a portion of the cost of installation of the infrastructure is allocated to each lot annually, collected with property taxes and remitted by Taney County to the trustee for the bondholders. The bondholders, through the purchase of the CID’s bonds, provided the construction money. The Branson area is a popular destination for vacations and retirement, with not many private sector jobs outside these industries. Branson Commerce Park provides an ideal location for enterprises that support Branson’s extensive medical facilities and its many resorts, hotels and restaurants. But there’s more. Because of its telecommunications infrastructure, Branson Commerce Park is a practical location for businesses that can be wherever there’s a good electronic link to the world. Entrepreneurs and employees who are attracted to the Ozarks may appreciate Branson Commerce Park’s proximity and easy access to residential neighborhoods, shopping, medical facilities, K-12 schools, and Branson’s RecPlex. Posted in Branson, Branson-Missouri, economic development, Missouri, Missouri economy, Ozarks economy, real estate development, Taney County and tagged Branson Commerce Park, Phil Lopez, Raeanne Presley. Bookmark the permalink. Reblogged this on AM edition.